Sci-fi thriller based on an early story by Stephen King (under pseudonym, Richard Bachman) - Los Angeles in the year 2017 has become a police state in the wake of the global economy's total collapse. 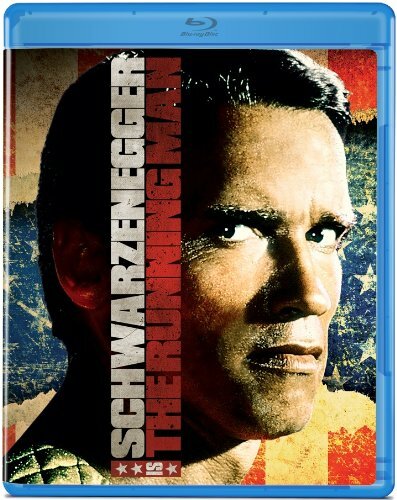 The Running Man is the top-rated TV show, where condemned criminals are given a chance for freedom by running through a gauntlet of heavily armed killers known as "Stalkers", the shows stars. Arnold Schwarzenegger stars Ben Richards, an ex-cop wrongly convicted of the massacre of unarmed civilians - He's joined by fellow prisoners Yaphet Kotto and Maria Conchita Alonso as they try to survive Stalkers, Fireball (Jim Brown), Captain Freedom (Jesse Ventura), Subzero (Toru Tanaka), Buzzsaw (Gus Rethwisch) and Dynamo (Erkabd Van Lidth). The all-star cast includes rockers Mick Fleetwood and Dweezil Zappa as revolutionaries and Richard Dawson (The Family Feud) as the show's smarmy host. Directed by TV's Starsky Paul Michael Glaser (Band of the Hand).